Just Dance 2 was released on October 12, 2010, in North America; with a MSRP of $39.99. It was developed by Ubisoft Paris, the same team behind Rayman Raving Rabbids 2 and Rayman Raving Rabbids TV Party, as well the original Just Dance. 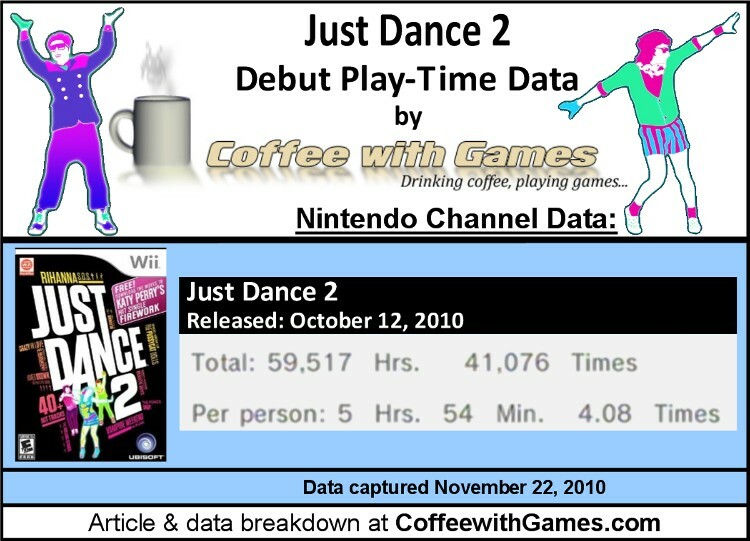 It took 42 days for Just Dance 2's play-time data to appear on the Nintendo Channel, as shown below. 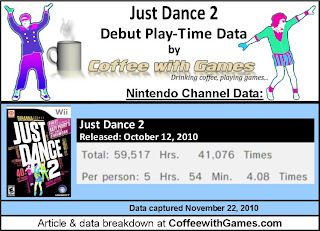 Does the reported game-play data for Just Dance 2, so far, show Wii owners perhaps can go "Dancing with the Stars", or do they need more practice with their dance moves? Let's take a look! The debut game-play hours shown above are for the United States of America Wii owners, not world-wide. Just Dance 2 has 10,067 Wii owners reporting their play-time data, on its debut on the Nintendo Channel 42 days after its release. Just Dance 2 has 59,517 Total Hours of game-play reported on its debut, with an average play-time of 5 Hours 54 Minutes "Per person" reporting data. The debut average play-time per dance session, for Just Dance 2, is just over 1 Hour 26 Minutes. For comparison, the original Just Dance has 1,135,065 Total Hours of game-play reported, since it released on November 17, 2009. The original's average play-time is 9 Hours 11 Minutes "Per person", and the average play-time per dance session is just over 1 Hour 8 Minutes. 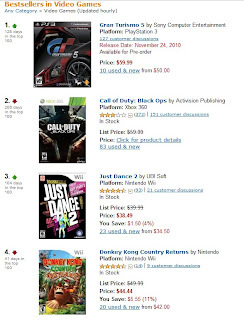 Just Dance 2 is apparently following in its predecessor's footsteps of sales, because it was #7 in the NPD's "Top Ten" video games sold in the month of October. Your eyes aren't fooling you (unless you drank decaf coffee today!). Just Dance 2 had a higher sales rank on Amazon.com than Donkey Kong Country Returns , just 3 days after Donkey Kong Country Returns' release. While the original Just Dance now has approximately 123,392 Wii owners that have reported their play-time data, the debut number of 10,067 Wii owners reporting data for Just Dance 2 is extremely encouraging when compared to other games' debut. So, even though the average play-time "Per person" is 5 Hours 54 Minutes, 6 weeks after Just Dance 2's release; I would think out of the 10,067 Wii owners reporting data, a few of those would be more than talented enough to go "Dancing with the Stars". Seeing how well this game is performing already, I'm kind of tempted to find it and give it a try. Have any of you played Just Dance 2, and if so, what do you think of the game? Is it a "dance" game you would recommend to other Wii owners, as a good social game? If you haven't played Just Dance 2, could you see yourself ever playing this type of game? I haven't played this yet, but my youngest would like it. It got pretty good reviews as I recall too - like an 8 at IGN. There was a whole Houseparty.com giveaway for it and everything. Can't say as the dancing games are my cup of tea, but my youngest loves singing and dancing games and tv shows (Glee) so I can't rule out eventually getting it. You may want to look at Just Dance Kids, which was just released as well, aimed at younger kids.